Day 2: Yerevan – History Museum – Genocide Monument & Museum -Matenadaran – City Tour. Arrival at Zvartnots airport in Yerevan and transfer to the hotel. Rest in Hotel. Breakfast. 10:30 Meeting with the cultural guide at the reception of the hotel. Money change nearby. The excursion starts at 11:00 with the visits to the History Museum on the Republic Square. Followed by the visit to the Genocide Monument and Museum. After lunch, visit to the Matenadaran Museum, which houses a unique collection of ancient manuscripts covering such lofty topics as philosophy, law, mathematics, medicine and geography, and concluded by the Tour of the City with walking at Cascade architectural complex. Dinner. Overnight at the hotel in Yerevan. Day 3: Garni – Azat River Canyon – Khosrov Natural Reserve – Havuts Tar – Geghard – Yerevan (Trekking distance 8 km). In the morning meeting with the trekking tour coordinators at the reception of the hotel. Way to Garni. Trekking from Azat River Canyon to a stone symphony, cross an 11th century bridge and enter the Khosrov National Reserve, thereby visiting the monastery complexes of Havuts Tar. Return to Garni. 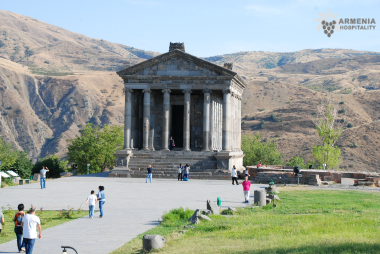 Visit to Garni Temple, site of Roman Temple of the Sun built in the 1st century. 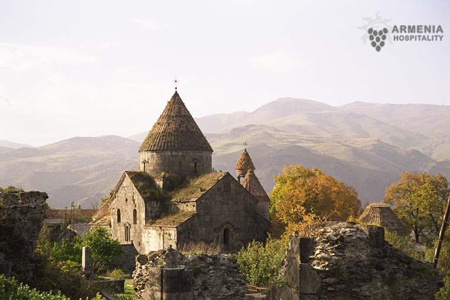 Soon after Armenia adopted Christianity, the temple became the summer residence of Armenian royalty. After lunch, visit to the cave Monastery Geghard. 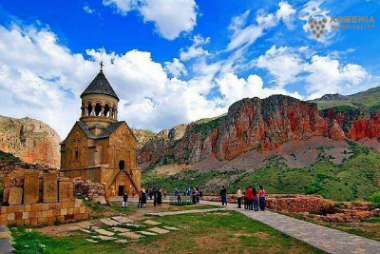 The name “Geghard” derives from the relics of the Armenian Apostolic church: the spear that one of the Roman guards had used to pierce the rib of crucified Christ. Drive to Yerevan. Dinner. Overnight at the hotel in Yerevan. Climbing up during trekking 7 km. Pick-up is possible. Day 4: Yerevan – Noravank – Spitakavor – Gladzor – Vernashen – Hermon (Trekking distance 14 km). We begin our exploration of Southern Armenia. Driving to the south we gain impressive views of the mountains, bizarre rocks and weirdly sculptured erosions add to the impressions. En route we visit Noravank, the masterpiece of medieval architect Momik, situated above an awesome gorge, and start hiking to Spitakavor. Our first stop is Gladzor village, a major center of science and calligraphy in medieval Armenia. On to Spitakavor Monastery passing the village of Vernashen. Walking through the village, we have an opportunity to meet and chat with locals and gain a true insight into their traditional ways of life. Picnic lunch during trekking. Way to Hermon village. Dinner and overnight at Lucytour hotel in Hermon Village. Climbing up during trekking-7 k. 1 River crossing over rock- stones. Pick-up is possible. Day 5: Hermon – Smbataberd – Yeghegis River – Tsaghats Kar – Shatin Obersation Point – Hermon (Trekking distance 12 km). We are ready to continue our adventures in Southern Armenia. We begin hiking to Smbataberd, a well-preserved medieval citadel built by King Smbat (12 km round trip). The setting of Smbataberd is perhaps the most beautiful in Armenia, with Arpi river valley at your feet. Here we have the blissful feeling of freedom from the mundane that only truly comes after a few days of travelling nature’s way – on one’s own feet. Then we reach the fertile valley of Yeghegis River where we hike to the isolated Tsakhats Kar Monastery. Our next stop will be at Shatin observation point to see Bezoar Goats on the opposite side of the gorge (Attention! Depending on weather of the day Bezoar goats may be seen or not). Picnic lunch during trekking. Dinner and overnight at Lucytour hotel in Hermon Village. Climbing up trekking-4/5 km. Pick-up is possible. Day 6: Hermon – Tatev – Tatev Big Hermitage – Devil’s Bridge – Khendzoresk -Goris (Trekking distance 6-7 km). Continue further to the South, on endlessly winding roads leaping through gorges over the mountains of Syunik. The trail is a perfect combination of natural and cultural wonders. We take the cable car (world’s longest) to the 9th century Tatev Monastery overlooking the Vorotan valley. After visiting the monastery, we will have a fresco lunch and short rest and then we continue our day full of activities. Trekking to Tatev Big Hermitage and continue walking to the limestone caverns of the Devil’s bridge with natural hot baths in a gorge so narrow, that the sun hardly reaches the bottom (trail length 5 km). Drive to Khendzoresk cave town at the altitude of 1580 m on the steep slopes of Deep Gorge. 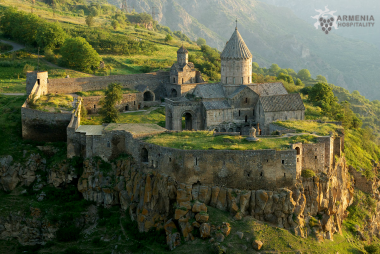 Picturesque rock formations and gently inviting nature make this one of Armenia’s most popular sites. Visit to Kndzoresk. On to Goris, a cozy town with fine stone houses with arched windows and balconies on tree-lined lanes. The pace of life is slow here with little commercial or industrial activity, or even tourist kitsch, so it really feels like you stepped back in time. Dinner and overnight at Diana or Mirhav hotel in Goris. Climbing up during trekking – 1 km. No need to have a pick-up. Day 7: Goris – Ughtasar – Tsghuk – Karahunge – Sisian (Trekking distance 5 km). Way to Ughtasar. One of Armenia’s least known and interesting attractions is to be found at the top of Ughtasar mountain. Beside the natural beauty of the mountaintop valley, the views and the small lake, there is an abundance of ancient petroglyphs which are between four and seven thousand years old. The site is located at an altitude of 3300 meters. By means of solid jeep type cars we will reach the mountain’s crater. Trekking from Ughtasar’s crater (3300m) to the mount Tsghuk (3550m). During trekking we will admire the stone fields of many petroglyphs. Picnic lunch during trekking. 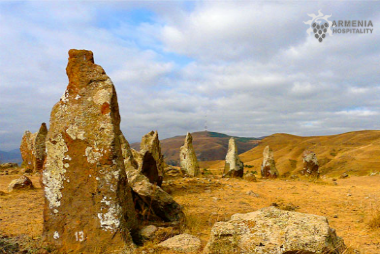 In the end of the day visit the Zorats Stones (Armenian Stonehenge) the age of which has been estimated to be 7,500 years or perhaps older (sixth millennium BC). Scientists believe that there is a tight connection between the observatory in Armenia and Stonehenge in Britain, since the latter is much younger (about 4,000 years old). Dinner and overnight at Basen or Lalaner hotel in Sisian. Climbing up during trekking- 3 km. Pick-up is not possible. Day 8: Sisian – Armaghan – Noratus – Lake Sevan (Trekking distance 15 km). Way to Armaghan. Hiking to Armaghan mountain. Armaghan mountain is about 65km away from Lake Sevan. Armaghan is a volcanic mountain at an altitude of 2,829m above the sea level. From Armaghan you can really enjoy the fantastic view of the lake Sevan. Picnic lunch during trekking. 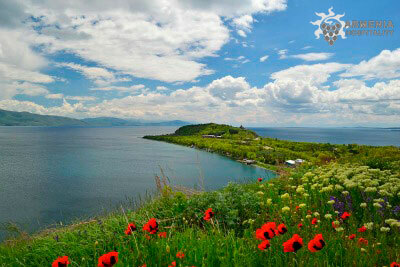 Drive to Lake Sevan, one of the few highly located big lakes (1950 m above sea level) in the world. Optional! On the way visit to Noradus depending on timing. The village of Noratus is remarkable for its large cemetery with its many cross-stones (khachkar). The majority of them belonging to the 13-17th centuries, as a group of cross-stones on family cemeteries. You can also view small rectangular tombs here, with cross-stones placed on top of them. Dinner and overnight at Bohemian Resort or similar hotel in Sevan. Climbing up during trekking- 5 km. Pick-up is possible. Day 9: Sevanavank – Lake Parz – Dilijan National Park – Goshavank – Lake Gosh – Dilijan (Trekking distance 14 km). Visit to Sevanavank. 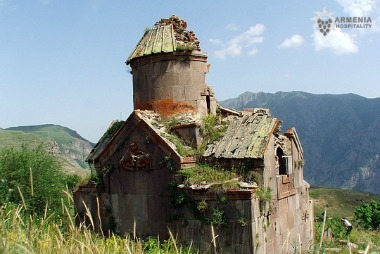 The nice Peninsula of lake Sevan is famous for its beautiful IX century churches of Sevanavank, viz. St. Astvatsatsin and St. Arakelots. Drive to Parz (Crystal) Lake to start the hike in Dilijan National Park along stunning forest trails, cross the wildly beautiful Areguni pass and reach Goshavank Monastery where the great scholar of the 13th century Mkhitar Gosh is buried. Lookout for morning birds that are particularly active at this time, explore the enchanting nature of the park as we take a gentle walk on well-defined forest trails. For those with more energy to burn we offer a short but absolutely fantastic walk to Lake Gosh above Goshavank. End the day with a drive to Dilijan, a small town that captures the spirit of rural Armenia and check in at our hotel. Evening visit to newly-opened Old Dilijan complex on historic Shamambertan street, experience the town as it was in the 19th century and observe the weaving of carpets by local women at Tufenkian Carpet Showroom. Picnic lunch during the trekking. Dinner and overnight at Dilijan Paradise or Dilijan Resort hotel in Dilijan. P.S. If the group will trek to Lake Gosh (6km), the whole distance of trekking of the day with Lake Gosh will be 14 km, if they will not trek to lake Gosh, the distance of trekking of the day without lake Gosh will be only 8 km. Climbing up during trekking- 4km. Pick-up is NOT possible as there is no road for any cars during the trekking distance. complexes, on both sides of Debed Canyon are UNESCO World Heritage Sites. Standing on a high plateau, they rise sharply against the background of forested slopes of Bazum ridge. The complexes are both beautiful but have very different atmosphere: Sanahin is rewarding with pure mountain air and views of the flower-filled meadows and in contrast, the monastery has a stern and ascetic atmosphere. Haghpat is a charming place, with the elegant bell tower soaring above other buildings, green hilly setting, a number of splendid cross-stones, the most unique among them depicting Jesus on the cross. Return to Yerevan. Picnic lunch during the trekking. Dinner and overnight at the hotel in Yerevan. Climbing up during trekking- 0 km. Pick-up is possible, but partly. Day 11: Yerevan – Aragats – Kari Lich (Stone Lake) – Yerevan (Trekking distance 14 km). Mt. Aragats, the highest peak of Lesser Caucasus is a popular target for mountaineers. The mountain has sub-alpine and alpine zones as well as four peaks and one of the biggest craters in the world, created by a volcano eruption in the distant past. The route up to Mt. 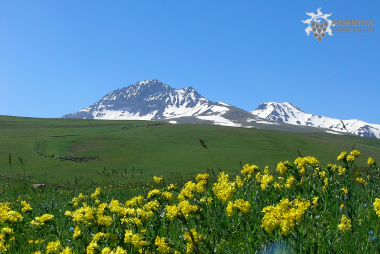 Aragats is virtually uninhabited and has gently sloping hills with occasional shepherds and beekeepers, many wildflowers and great views. Hiking is especially spectacular in spring when the entire mountain is literally covered with poppies and mountain flowers. The most accessible peak of Aragats is the south peak, starting from Kari Lich (Stone Lake), we will take this 3 hour hike to the summit on a steady slope (3,879m). More challenging is the trek to the western summit (4,080m) with spectacular views to Mount Ararat. Picnic lunch during the trekking. Dinner and vernight at the hotel in Yerevan. Climbing up during trekking- 5/6km. Pick-up is NOT possible as there is no road for any cars during the trekking distance. Day 12: Yerevan – Khor Virap – Echmiadzin – Yerevan. 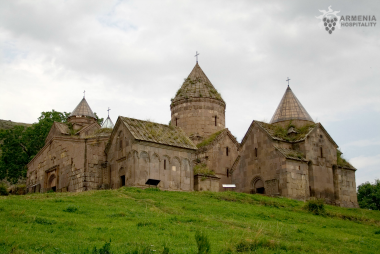 After breakfast, drive to Khor Virap, one of the most important Armenian monasteries, located near the border with Turkey. The monastery offers beautiful views of Mount Ararat, the symbol of the Armenian people, today in Turkish territory and stands on the site where St. Gregory the Illuminator was imprisoned for thirteen years, after which Gregory, baptizing the king Tridate III, made in Armenia the first Christian nation in the world. Then visit to Echmiadzin, the holiest city in Armenia, the seat of the Catholicos, the head of the Armenian Apostolic Church and is located about 20 kilometers west of the capital. Lunch, Free afternoon in Yerevan for individual visits, shopping. Dinner and vernight at the hotel in Yerevan. Day 13: Early in the morning transfer to Yerevan-Zvartnots airport. Return flight.